Recommendation: Can one change their fate? Well, watch this movie to see if Lee Nugent has been successful or not. 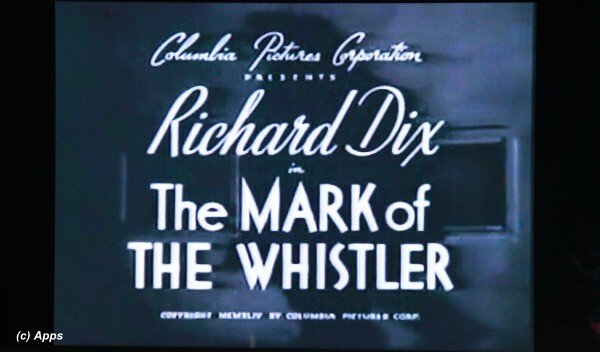 The Mark of the Whistler is a 1944 American mystery film noir based on the radio drama of the same name. Directed by William Castle this is the second of the eight film noir series adapted from the radio drama produced in the 1940s. Richard Dix again stars as the main character in the film with Otto Forrest as The Whistler narrating in the background. Lee Selfridge Nugent had seen better days in his life, but now has been reduced to close to destitution because of ill health and bad luck. He comes across a paper ad by Standard Savings Bank about dormant accounts worth of hundred dollars or more which haven't been claimed in twenty years or longer, and unless claimed legally in sixty days they will be claimed by the government. Lee uses this ad to claim one of the dormant account as he is desperate to get some money. But then the minute he cashes that account he is being followed, hunted. Why is he being hunted? What is the past in the dormant account that is now become a cause of his present problems? How will Lee come out of this? Another 60 minutes of a thriller that begins so ordinarily but takes on unexpected turn of events. However it does amaze you how easily the swindling happens on the movie. It may be very hard to do that in this current era and age where everything is digitalized. Although not as much as a chiller as before but none the less, interesting to watch how a person tries to mend his fate. An easy short mystery that is also fun to watch. 1) This film reminds me of one episode titled "Good-Bye Charlie" in the Murder, She Wrote hit TV Series. Although Angela Lansbury doesn’t reprise her role as Jessica Fletcher in this particular episode, she narrates her newest novel about a private eye and his girlfriend trying to cash in on a dead relative's will.